Would The US Extradite UK Blogger For Linking To Works In The Public Domain In Other Countries? Just John points us to a recent Reddit thread, in which a rather basic suggestion is made for how Hollywood could do a much better job killing movie piracy: by offering something better. It was summarized with the following graphic: Or, basically, create a service that doesn't limit people and offers them what they want, in a convenient manner, at a reasonable price. Simple. Except... that's just not how the MPAA works. As we've stated many times in the past, services like Spotify have massively shrunk how much people in Sweden use The Pirate Bay for music. 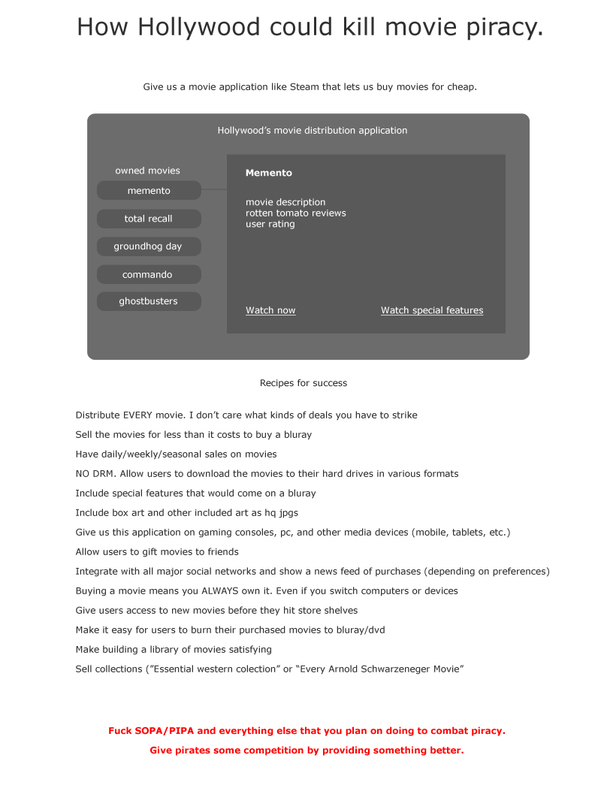 They now use it for other media, because no one's really created a "Spotify for movies." In fact, whenever the industry seems to get close to creating a good product for video -- see: Hulu or Netflix -- the industry then freaks out that it's going to cannibalize their old way of doing things, and tries to make it worse. It's why the big studios have been pulling content from both services, and trying to limit what they can provide. And that's exactly the wrong thing to do. That's how you encourage more piracy. 1: They don't care about anything but striking deals. Your position as a 'valued customer' is a farce. They value nothing about their relationship with you. 2: Their ideal business model does not rely on an exchange of valuable goods/services for money. Their goal is a unilateral, unbounded growth in their returns. The existence of a product is merely a ruse. 3: Having 'sales' would defeat all they've attempted in the pursuit of higher returns on lower volume via artifical scarcity. 4: Again, choice and post-sale value erodes the functionality of an artifical scarcity. These people cannot be reasoned with. The only thing you can do is conquer them.